The third day of our Connecticut invasion was a quiet one, thank goodness. Following the previous day’s victorious battle, the men needed some time to rest, recover, and prepare for their next challenge. And I needed some time to browse Pinterest. Day four, our final day in the Nutmeg State (whatever that means? ), was to be our longest, most challenging day yet. My wake-up call came at 7:20 a.m. and nearly knocked me out of bed, it was so loud. A bull horn would have been more subtle. As I made my way down to breakfast, ears ringing, I looked outside and saw that the previous night’s torrential rains had given way to a clear, sunny day. However, a stiff, cold wind gave the day an ominous feel. After I woofed down some runny eggs, home fries, and around a half a pound of salty bacon, my stomach had an ominous feel, too. Once again it was silent on our charter as we traveled the six or so miles to Hamden to face the Bobcats of Quinnipiac. 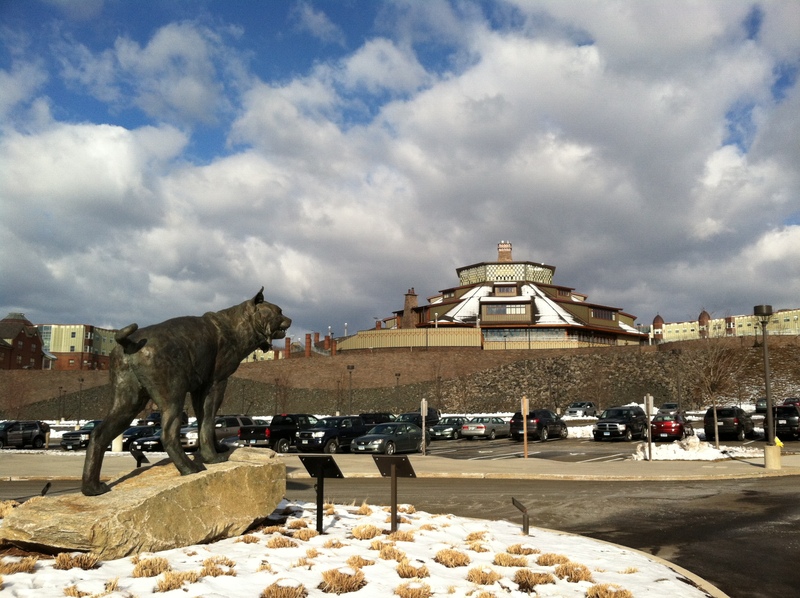 After climbing a long hill, we finally reached the summit and the TD Bank Sports Center, i.e., The Den. Out front, a large Bobcat, which had obviously been captured and frozen in carbonite, much like Han Solo, stood guard. 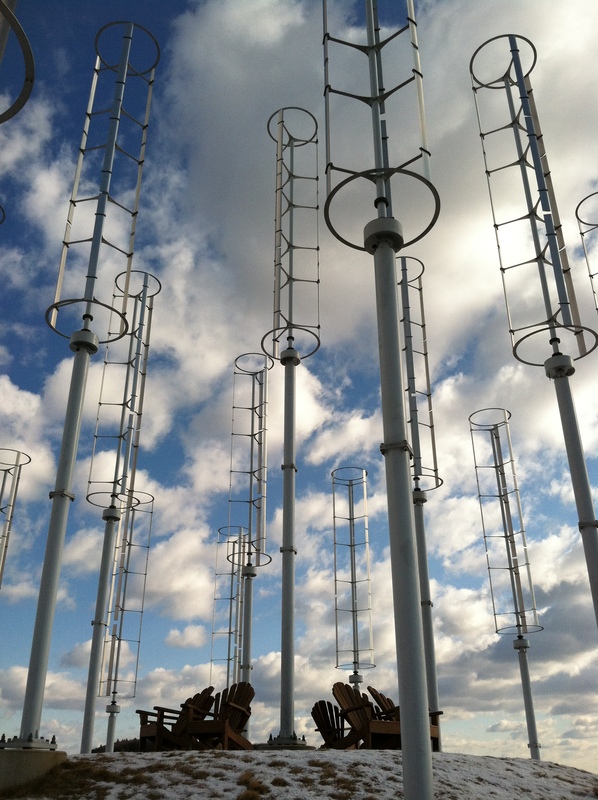 Across from the center, there was a strange complex resembling a ski lodge and a number of oddly shaped windmills. Obviously this was their source of power. If I could only dismantle it, I thought… But then, I thought, Geez it’s cold out here! And I ran inside. As soon as I entered the building, a Quinnipiac supporter tried to push one of his little yellow “Go Bobcats!” towels on me. Being from Pittsburgh, I felt strangely compelled to take the golden towel and whip it above my head. But somehow I managed to fight off the urge and escape the Siren-esque trap. Prior to the contest, the men were energetic and upbeat. They even participated in some kind of pre-game dancing ritual to get themselves fired up for the battle that lay ahead. And what a battle it was. RMU dug itself a 10-point hole mid-way through the first half, and it looked like the Bobcats might run away with an easy victory. But the resilient Colonials managed to scrape and claw their way back into the game, and by halftime the score was tied, 38-38. The second half continued to be a tight, hard-fought struggle. The men battled courageously despite the hostile environment inside the arena, but at the end the Colonials fell just short, 73-69. As they walked back to their locker room, the men were forced to watch the Bobcats celebrate on their own court in front of a delighted home crowd. It was a painful show that, no doubt, the Colonials will not soon forget. The ride to the airport was a somber one, as we began our long journey back home to Pittsburgh. But although our Connecticut adventure ended in defeat, Head Coach Andy Toole and his men were able to come away with their heads held high, knowing that they had fought hard and courageously. Now they get to prove their worth in the 2012 Northeast Conference Men’s Basketball Tournament, which begins this Thursday as the Colonials host the Hawks of Monmouth at The Chuck, aka, the Sewall Center Arena. As I look back to my time embedded with the Robert Morris University Men’s Basketball team, the memories are bittersweet. Bitter, because I wasn’t able to help the team more; sweet, because I had my own double bed, flat-screen TV, and no kids to wake me up before the break of dawn. But such is life on the road.